Gluten free a weight loss diet? NO. Check out this article for valuable info! I saw this awesome article this morning on the Gluten Free Cooking School website. This was one of the first websites I found when going gluten free and have gotten a wealth of information from Mary Frances and her husband John. When I read this article, it really sums up so many things that I have wanted to tell people! So instead of my version – check out what John has to say about gluten free diets! I’ve left in all of the links so you can research further on your own. When you are done, head over to their website and check out all of the fabulous information and recipes available and sign up for her cooking school! There’s often a lot of confusion about starting a gluten free diet. Most people, when they’re interested in eating gluten free, look up “gluten”, find out that’s it’s contained in wheat, and they figure all they need to do is avoid wheat in their diet. Then they hear that gluten might be in other grains as well, and that it can be a “hidden” ingredient in some foods, so they end up confused as to what they can and cannot eat. Compounding the issue is the prevalence of gluten free food products that are starting to appear in grocery stores more and more frequently. Are these boxed flour mixes and frozen dinners healthier than a whole foods diet that happens to contain gluten? So if you’ve heard about the gluten free diet in the news, or a friend mentioned that they’re trying it out, or you read that Miley Cyrus is now gluten free, where do you start? Do you just avoid wheat and eat everything else like normal? Are processed foods bad? Are there any other ingredients that you need to look out for besides wheat? I think the answer to these questions is contained in the reason that you’re thinking about going gluten free. 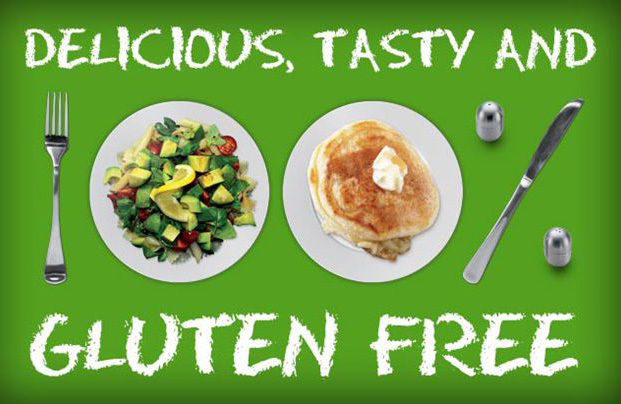 Let’s take a look at 4 different ways to eat gluten free, and see which one will work for you. SAD minus gluten – This diet doesn’t have a particular name, but it’s what most people try at first when they go gluten free. The SAD, or Standard American Diet, generally consists of 50% carbohydrate, 15% protein, and 35% fat. When people decide to go gluten free, they often unconsciously stick to these amounts, and simply replace gluten-containing carbs with new gluten free carb sources. Is this a healthy diet? Well, the answer is “It depends.” It depends on your particular situation and your health. If you’ve just been diagnosed with celiac disease or a similar gluten intolerance, removing gluten from your diet is, hands down, the best (and first) thing that you can do is to improve your diet and overall health. In this case, eating the “SAD minus gluten” diet is not a bad choice, especially as you’re getting your feet under you on the whole GF thing. Once you’ve been gluten free for a while, and seen improvements in your health, you may be inspired to continue to improve your health through other dietary changes. Removing common allergens such as milk, soy, and corn are often a reasonable next step. Some of the diets mentioned below may be good choices too. Can I Lose Weight On A Gluten Free Diet? If you’re trying a gluten free diet to lose weight, and you keep eating the same number of calories, and the same amounts of carbs, fat, and protein that you ate before, you’re almost certainly not going to lose weight. Removing gluten from your diet is not a magical potion for weight-loss. In fact, we can attest that you can gain quite a bit of weight if you have daily access to delicious home-made gluten free biscuits, pizza, cakes, etc. That being said, there are weight-loss diets that are gluten free. If you’re looking to increase your energy levels, lose weight, or generally improve your health, then I recommend starting with one of the three diets below. Rule #5: Take one day off per week and go nuts. Eat anything that you want (except gluten, if you have a medical reason to avoid it). I choose and recommend Saturday. Mary and I did the Slow Carb Diet for several months last year and had great results. We both lost significant amounts of weight, and actually enjoyed the diet. The thing that I love most about the SCD is that it is naturally gluten free six days of the week, and the only time you have to watch what you eat (in terms of gluten) is Cheat Day. Primal/Paleo Diet – Mary and I are currently on a 30-day trial of the Primal diet, and things are going great. I have a lot more energy when I eat low-carb, and I don’t crave more food a few hours after eating like I used to. The Warrior Diet – The Warrior Diet is similar to the Primal diet, but with one major change: You only eat once a day. You fast all day (although you can eat some fruit during the day if you’re really hungry), and then eat a huge meal at night. Ori Hofmekler, the man behind the Warrior Diet, recommends a Paleo diet approach to the foods that you eat – i.e., meats, veggies, and fruit. He also says to focus on protein and fat for your big meal, and finish up with carbs if you’re still hungry. I wouldn’t recommend that you go straight from the Standard American Diet to this one. Fasting for most of the day is very hard and painful if your body is used to receiving grain and sugar based meals on a regular basis. Now that we’ve been eating Slow Carb/Paleo for 20 months, we can comfortably fast long enough to do the Warrior Diet, and we do follow that plan on days where we are not terribly hungry or when it’s just not convenient to eat gluten free. A gluten free diet, though it can improve your health if you have celiac or some other wheat/gluten allergy or intolerance, will not necessarily result in weight-loss. Some people will lose weight; others will not. However, there are weight-loss diets that are inherently gluten free. These weight-loss diets are ideal for those who need to be gluten free and lose weight. There is also plenty of anecdotal evidence that these diets will improve other aspects of your health. To make it even better, these diets are all enjoyable and do not focus on calorie restrictions. You’ll probably experience carb cravings, but you shouldn’t actually be hungry. Sounds pretty good, doesn’t it? I’m so glad I found your blog- it’s definitely informative, and I’ve been enjoying reading through it. We definitely do need to show support for each other, as everyone has their own stories and experiences that we can learn a lot from! People forget that whole grains and gluten are beneficial to those who have a fully functional immune system- we instead, lack the genes necessary to tell our immune system that gluten is a friend and not a foe! Hope to keep in touch with you, and looking forward to more of your posts! Thank you Chynna………I’ve been trying to post stuff I wish I had known when I started! I am surprised by the number of people who think they can eat whatever they want just cauze its gluten free! I hear this all the time and it makes no sense to me. I look forward to more of your posts as well! Thank you for this epic and detailed article on Gluten Free Diet. I have used some of its information as the reference to complete this post on 5 best CrossFit diet plans on my blog.